Proper analysis of the Japanese organic market is faced with the difficulty that until recently, no clear definition of "organic product" existed. Moreover, the voluntary guidelines (i.e. not mandatory) on sustainable agriculture issued by the Japanese Ministry of Agriculture, Forestry and Fisheries (MAFF) in 1992 and applied until the year 2000, did not require independent organic certification. 6. Reduced fertilizer grown: products where the use of chemical fertilizers is reduced to less than 50 percent of the average fertilizer use. The above categories led to substantial confusion as to what rightly can be claimed organic agriculture or products grown and processed according to proper organic standards as defined in most other countries. A survey carried out by MAFF in the early 1990s showed that of 1 459 so-called organic farming households, only 32 percent practised chemical-free farming; the remaining 68 percent were classified as practising "reduced use of agro-chemicals" (OTA, 2001). In April 2000 new Japanese Agricultural Standards (JAS) legislation for organic agriculture was implemented. The revised JAS law also included regulations on the labelling of perishable organic products, which took effect on 1 June 2000, and on the labelling of processed food products, which took effect on 1 April 2001. The legislation was adopted to protect the consumer from many products appearing on the Japanese market which were inaccurately carrying the name "organic". Thus, only recently is there a clear definition and control on truly organic products and, therefore, data on genuine organic production. Sales and import data were not available at the time of writing of this report (June 2001). In this report "green labelled products" stands for all products which in Japanese are called "Yuki Shokuhin", but do not meet the JAS definition of "organic". Therefore, "green products" are those which fall under the categories 2 to 6 mentioned above. The reader should continuously keep in mind the definitional difficulty of the Japanese organic market. Production of organic crops in Japan is difficult, due to the scarcity of arable land, combined with the Japanese hot and wet climate conditions. However, a wide range of agricultural products are produced organically, including rice, green tea, green vegetables, sweet potato, taro, pumpkin, potatoes, citrus and many other fruits. Discussions with different organic certifying agencies suggest that there are around 3 500 organic producers in Japan, farming a total area of less than 1 000 ha. Production trends for organic fruit and vegetables appear to be moving towards value added product lines, such as prepackaged salad mixes. The group certifying process provided for under the new JAS regulations enables group managers of several holdings to pool product and target specific markets. Japanese farms (both conventional and organic) are mostly small (less than 0.5 ha) with around 85 percent of farmers part-time with an average age of 65 years. Production from Japanese conventional farms is in decline, but it is expected that organically certified products will increase both in area of production and in the range of products presented to the market. The new JAS regulations for product labelling formulated by MAFF have been operational since 1 April 2001. Box 1 gives the sequence of the main events that led to the legislation. On 1 April 2001, the proposed "organic" labelling law took effect in Japan. This box provides the sequence of the main events that led to the existing legislation. April 1992: MAFF produced organic labelling guidelines. It was not a law, so there were no penalties for non-compliance. 1998: MAFF decided to establish an Organic Certification rule in JAS law. July 1999: The concept of a revised JAS law was passed by the Diet (Congress). June 2000: The revised JAS law took effect. Producers and traders not complying with the regulations could be punished. April 2001: Control of the "organic" label took effect. Source: The Organic Standard, May 2001. The established JAS law is based on the CODEX guidelines for organic agriculture. 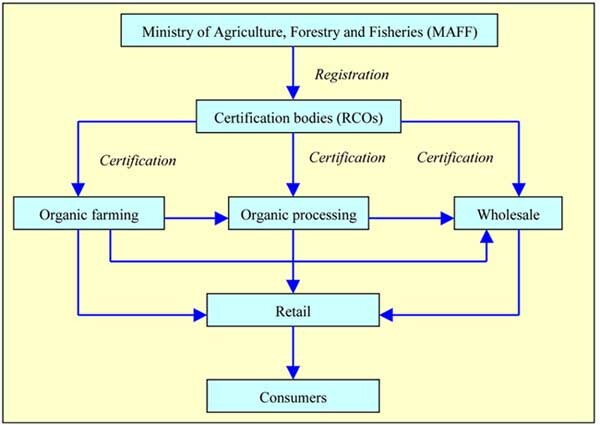 Under the new regulation, organic certification bodies are required to be registered (accredited) with MAFF and are now called Registered Certification Organizations (RCOs) (see Figure 1). Specific regulations on imports and labelling requirements are given in section three of this chapter. The JAS programme is staffed by three persons and a manager. The MAFF Web page, http://www.maff.go.jp, provides information on JAS regulations. Copies of key documents can be downloaded from this site. To find out about the certification process, access the MAFF Web page or contact one of the registered Japanese certifiers (listed in Annex II). These agencies can provide updated information on Japanese and approved foreign certification agencies. Government policy aims at encouraging consumers to buy domestically produced products where and when they can. There is no support policy or specific funding for organic agriculture. Because there was no clear definition of organic products for a long time, it is difficult to estimate the market value of organic sales in Japan. Many sources give different numbers, sometimes with a factor ten difference. The historical broad interpretation of the term organic has meant that the data gathered on fresh fruit and vegetables covers all sales and does not categorize certified organic products. There are no Government records that identify certified organic product imports or local sales. However, the JAS regulations provide the mechanism and requirement for data on certified organic products to be gathered from 1 April 2001. It is estimated that the impact of the JAS regulations has resulted in a drop of up to 99 percent of products presented to the market as "organic". The International Trade Centre UNCTAD/WTO (ITC, 1999) estimates the value of organic retail sales in Japan in 1998 at US$1.3-1.5 billion. An Organic Trade Association (OTA) study released in early 2001 refers to two other sources: (i) an unnamed research report estimating the total retail value of the Japanese organic market in 1999 as approaching US$3 billion, including all six categories of organic and reduced chemical fertilizer and low pesticide inputs as described in the introduction; and (ii) the Japanese External Trade Organization (JETRO) which estimates that the organic markets retail value rose from approximately US$1 billion in 1995 to US$1.8 billion in 1996 and to US$2.5 billion in 1997 (OTA, 2001). One should note that all these estimates have been made prior to the implementation of the JAS legislation, and therefore include all six categories of "Yuki Shokuhin" (see introduction). Based on information obtained from market sources, it is estimated that the retail value of genuine certified organic products is around US$350 million, or about 1 percent of total food sales in Japan. Two sources confirm this number: a technical paper presented to the International Federation of Agriculture Scientific Conference, Basel 2000 (Tokue, 2000), and the above-mentioned OTA study. The latter used the value of organic domestic production at retail level, plus the value of imports in 1999, and adjusted for the expected growth rate in 2000. However, the report states that (compared with the much higher value given in the sources referred to earlier) there is a large grey zone of products, which may be produced with low chemical pesticide and fertilizer inputs, but do not comply with strict organic standards (OTA, 2001). Therefore, total "green" product sales in Japan are estimated in an order of magnitude of US$2.5 billion, while genuine certified organic products account for US$350 million (or 12 percent of the total "Yuki" sales). While current organic sales are estimated at about one percent of total food sales, some market sources expect the percentage of organic sales in total food sales to increase to around five percent by 2005. However, the introduction of the new JAS regulations has somewhat slowed the overall impetus of organic production and promotion. The new regulations are said to have created a dilemma for traders, who have been selling large volumes of "green" low chemical input product as organic during the past decade. These "green" products, however, do not qualify as organic under the new standard. There has been a large investment in green food labelling by many of the major companies in Japan. However, green labelling could provide a stepping stone for producers to later move to certified organic status. Organic sales are dominated by rice, wheat-based products, soybeans and a wide range of processed products. Fresh and frozen fruit and vegetables comprise less than five percent of the total certified organic trade. There is no precise data available on sales volumes of certified organic products, due to the definitional problem of "organic", as mentioned earlier. Vegetables: onions, carrots, potatoes, bell peppers, salad vegetables, broccoli, cabbage, asparagus, pumpkin, sweet potatoes, green beans, ginger and taro. Fruits: mandarins, kiwis, strawberries, oranges, bananas and some other tropical fruits. Although growth is expected in the organic market as a whole, sales of organic fresh fruit and vegetables are unlikely to increase their market share in the near future, mostly because of the barrier presented by the random fumigation by port officials of all fresh food products entering Japan. Under the JAS, an organic product that has been fumigated cannot carry the organic label. Some market sources mention that fumigation is carried out for over 70 percent of a shipment, regardless of whether the shipment carries quarantine pests. The premium for organic products varies but generally ranges from 20 to 30 percent above the price for conventional products, but can sometimes reach 100 percent. This trend is witnessed across most lines including imported kiwifruit and pumpkins. For example, at a JUSCO supermarket in Chiba, prices for fresh ginger differed as follows: imported organic, Y198; Japan grown, Y178; and non-organic imported from China, Y100 (January 2001). Also, green label potatoes from Hokkaido had a 50 percent premium (JUSCO) over imported potatoes. The three main channels through which organic products are sold to consumers are: (i) the Teikei system; (ii) supermarkets; and (iii) home delivery. In the early days of organic marketing, virtually all sales found their way through the Teikei (box) system of direct supply. The Teikei (box) system, which promotes the direct distribution of products from farm to consumer, is based on the principle of the producers and consumers "shaking hands" and supporting each other. In some cases, the sales are coordinated by a distributor who works on behalf of the producers, while in other situations, farmers directly mail or deliver to consumers. The first efforts of the Teikei system were co-ordinated by two groups: (i) the Japan Organic Agriculture Association, established in 1971; and (ii) the Nature Farming International Research Foundation. Supermarkets which handle organic produce are expected to source their products through food brokers and traders and wholesalers. Consumer cooperatives have "traditionally" sold organic products. They have a national membership of about 18 million people and represent about 15 percent of Japans population. Cooperatives, such as the Kobe Cooperative based in Osaka, have purchased certified organic products for many years. With the introduction of the JAS, Kobe Cooperatives organic imports are limited to pumpkin and grapefruit. Supermarkets are a relatively new phenomena in Japan; while they stock organically certified products, green labelled products are becoming increasingly dominant in these stores. Companies, such as Dole Japan and JUSCO, and large cooperatives, such as ZEN-NOH (National Federation of Agricultural Co-operatives Association), have developed sophisticated green labelling and product promotion strategies linked to company monitored production programmes. For producers of small volumes of organically certified products aiming to secure premium prices for quality products, the supermarkets are unlikely to offer the returns available through specialist stores. According to the Japanese Economic Newspaper as of mid-2001, Nichirei, a large frozen-food importer in Japan, is expected to start selling frozen organic vegetables from China in supermarkets nation-wide. Nichirei was able to reduce prices by contracting with local Chinese vegetable farmers and processing the final product in China. Similarly, the leading supermarket retailer, JUSCO, began selling frozen spinach, green asparagus, onions and broccoli imported from China as part of their "Top Value Green Eye" private brand in late 2000 (FAS, 2001). Food processing and manufacturers handle about 10 percent. A recent development includes organic sales through the Internet. Currently, there are 2 400 Internet sites offering green and organic products for sale. The total value of organic "e-sales" in Japan is not available. The distributors and retailers interviewed as part of this study felt that the vast majority of consumers were not really aware of the difference between organic food products and green labelled products. Thus, when consumers see a green labelled product, they mostly feel that their food safety concerns are being met. Surveys of the organic market in Japan have thus not distinguished between organically certified products and other green labelled products. The result has been that the data produced has overestimated the production figures and trends for certified organic product demand in Japan. Another source (FAS, 2000), states that according to some supermarket representatives, the typical organic consumer is an upper middle-class housewife in her 30s or 40s with children. These women tend to have a university education and are concerned about health, rather than the environmental benefits of organic products. Japanese consumers prefer to buy domestically grown products. There is a trend to increasingly buy on price and food safety assurances. Perfect shape and colour of a product are important but are no longer the key selling points. Food safety is now a major factor for consumers, combined with traceability of the product. Eating food from one's own country was perceived to be a good thing. If imported organic food was to be purchased, then Australia and New Zealand would be the respondents' second preferred option, followed by a number of other countries, all ranked according to the consumers perception of which countries are the most clean and green. Retailers and distributors also highlighted changes in the buying patterns of many consumers. They noted that younger consumers (under 30 years of age), particularly for couples where there are two persons working in the same household, are purchasing more frozen and processed convenience foods. Source: based on interviews with market sources. Note that french fries comprise around 40 percent of frozen certified organic vegetable sales. The remainder of sales is made up of a mixture of broccoli and carrots and frozen sweet corn. Importing frozen rather than fresh vegetables avoids the commercial risks of random product fumigation. One of the main constraints to market development of fresh organic products is the lack of consumer knowledge on the difference between organic and "green" products. Over the past few years 85 percent of consumers purchasing organic food have been buying "organic" produce primarily for food safety reasons without developing an awareness of the difference between certified organic and green labelled product (Tokue, 1999). Green label products are promoted as being chemical free, environmental friendly and safe for human health, which makes it difficult for consumers to distinguish them from organically certified food. Another constraining factor for further development of the organic market is the high price premium. Consumers are willing to pay a price premium of 10 to 20 percent above conventional prices (FAS, 2000), but many times price premiums are beyond that range. Additionally, a certain distrust of the legitimacy of organic products exists among groups of consumers, especially for imported certified products. Moreover, the product assortment is small and widely recognized organic brand names are absent (FAS, 2000). Finally, information to the consumer on the new JAS logo has been insufficient, and one source states that there is a serious danger that the confusion during the first year of JAS organic standards and logo will cause consumers to lose interest in and reliance on JAS organic certification (The Organic Standard, 2001). Under the new JAS law (April 2001), all products labelled as organic must be certified by an RCO, and must display the JAS logo (Figure 2), as well as the RCO's name. Since the start of the implementation of the new legislation, 38 organizations have been registered as RCO. Although it is possible for foreign certifiers to register, so far, all RCOs are Japanese (The Organic Standard, May 2001). For foreign organic exporters to the Japanese market, there are three ways to obtain permission for using the JAS logo. (i) Approved country status: awarded to countries with a certification system equivalent to Japanese organic law. The approval process is carried out by MAFF, which will review the standards and certification systems of each country applicant against the JAS before issuing approved country status. Certification bodies in an "approved" country abroad need to be registered at the MAFF, in order to be able to certify producers using JAS law. Once registered, the organic producer (abroad) is allowed to put the JAS logo on the package of the organic product before exporting it to Japan. (ii) As in the previous case, the fundamental requirement is to be approved as a country as equivalent to Japanese organic law. However, the difference is that the certification body abroad (which does not need to be registered at the MAFF) certifies the product as "organic conform to national organic standards". The product can be imported into Japan with the organic logo of the country of origin, and without the JAS logo. The JAS logo is put on the product by the importer before the product arrives at the market. (iii) Where a countrys certification system has not been approved by MAFF as equivalent to JAS standards, certification can be gained either through a Japan-based and MAFF accredited organic certification agency (RCO), which carries out production and farm audits in the country of origin or through a local certification agency which has a reciprocity arrangement with a MAFF registered RCO. Ensure that you are up-to-date with any changes in these regulations; see Internet site http://www.pure-foods.co.jp/index2.html. The new labelling requirements have created some complicated issues with organic processed foods. Processors that use imported products must have an RCO verifying that the materials comply with JAS standards. The deadline for these to take effect was originally 31 March 2001, but after protests from processors the MAFF postponed it to 31 March 2002. Therefore, all processors have one (additional) year to apply to an RCO and receive verification of equivalency for their raw materials (The Organic Standard, May 2001). In producing and preparing organic products for the Japanese market, it is advised to work closely with the Japanese importers to ensure that all packaging, labelling and quarantine requirements are met. For new products or brands, the name is important. Care must be taken to avoid names that are not appropriate in Japan. Thorough market research is essential for any new product being developed for the Japan market. Importers and distributing companies, which have the knowledge of specific market requirements, are most useful in order to avoid unforeseen negative surprises. Phytosanitary requirements for each product can be obtained from the importer or the MAFF Quarantine Division (see MAFF Web page) on a crop-by-crop basis. It is important to note that compliance with these regulations does not guarantee that the product will not be fumigated even when hot air treatments have been applied and the products have been cleared by quarantine in the country of export. The total imports of fresh fruits and vegetables that would qualify under the JAS as organically certified product is unknown. Based on market sources, the value of imports of "Yuki" products (green labelled and organic) is estimated at Y8 billion (1999 figures). According to another source (Sogo market research firm), the total value of organic imports into Japan are estimated at US$90 million in 1999 (OTA, 2001). There is no data available for organic fresh fruit and vegetable imports into Japan. Table 2 provides volumes of imported conventional fresh fruits and vegetables, as well as estimates on the percentage organic of these imports (percentages have been drawn from information provided by importers and distributors). <1% is an approximation drawn from discussions with distributors. *Organic banana imports estimated at 8 000 tonnes, but certification status unknown. New Zealand exports an estimated 1 500 tonnes of organic pumpkin and 2 300 tonnes of organic kiwi to Japan. Fresh organic exports from Australia include 100 tonnes of fresh carrots, 60 tonnes of fresh asparagus and a small quantity of mango. Bananas have been sold in Japan from Colombia, Mexico and the Dominican Republic, labelled as organic. Currently only non-certified organic banana product lines (cavendish and lady finger varieties) are available, mostly from the Philippines, which supplies more than 70 percent of Japans organic banana consumption. A large percentage of these bananas are marketed under a green label (reduced chemical). Because of publicity surrounding the Japanese Governments role in funding production of "safe" bananas in the Philippines over the past 12 years, many consumers purchase these bananas believing they are organic. Table 3 provides estimated organic horticultural imports into Japan for 2001, based on information supplied by importers and distributors. 4. New Zealand (kiwi, pumpkin, frozen vegetable, pouched sweet corn). Other countries exporting organic fresh fruit and vegetables to Japan include the Philippines (green label bananas and other fruit), Chile (kiwi), Argentina (beans) and the Dominican Republic (bananas), among others. Contact details of the main importers of organic fruit and vegetables into Japan are given in Annex IV. There are many factors to be considered in establishing a price (fumigation losses, quality, volume, seasonal supply, promotion required, storage, local certification costs, transport costs, etc). Therefore, exporters, importers and distributors are reluctant to discuss prices paid. They are more comfortable indicating percentages paid above conventional products. Generally, the indication is that there is about a 20 percent premium paid for organically certified products. This is confirmed by one source, which states that organic vegetables are generally sold at a 20-30 percent price premium above prices for conventional vegetables (Agriculture and Agri-Food Canada, 1998). To reduce commercial risks, some companies are exporting fresh organically certified product but selling it under a "green" rather than an organic label. Green labelling is part of a marketing strategy developed by many Japanese companies to market fresh fruit and vegetables as safe food. These companies have developed their own unregulated food production practices and environmental management criteria that aim to minimize pesticide use and promote care of the environment by farmers. The programmes are monitored by the companys field staff to ensure that the farmers comply with the prescribed green production practices. The production procedures for green labelled products do not meet the JAS organic requirements. However, the main advantage of green labelled products is that if fumigated in the import harbour, the products are not required to be relabelled. Many of these "green" products are imported from the United States, the Republic of Korea and China. Prior to the implementation of the new JAS, many of these now green labelled products were labelled and sold as organic. Imports of organic fresh fruit and vegetables into Japan are faced with some constraints, of which the most important are described below. (i) The high quality standards and phytosanitary requirements for imported fresh fruits and vegetables have a constraining effect on organic imports into Japan. The random fumigation of fresh organic products entering the country presents a major disincentive to export to Japan. Fumigation makes the organic fresh product lose its "organic" status, and consequently, the product can not be sold with an organic price premium. Hence, until more sophisticated phytosanitary treatments that are compatible with the JAS legislation are developed, a large part of the potential market for organic fresh fruit and vegetables will remain unfilled. (ii) Potential exporters of organic horticultural products to Japan need to undertake careful market research before new products are introduced into the Japanese market. Access to the market can best be gained once the trust of a Japanese importer and distributor has been obtained. This process must be regarded with respect and patience. (iii) The confusion between genuine organic certified products and other "green" or "health" products has made the majority of the Japanese consumers think that "green" and "organic" are exact synonyms and that both types of products are produced using the same farming practices. It is expected to take considerable time before the difference is understood by the majority of consumers. Until then, it might be difficult to sell an organic product at a higher price than a "green" product. Many (potential) organic traders see Japan as an attractive organic market to which to export. Its population (more than 126 million persons) has a high average income, and a significant percentage of that income (20 percent) is spent on food. The population is ageing rapidly, and health concerns have triggered wide attention for and demand of "safe" and "clean" food products. Moreover, domestic organic production is low given the difficulty of growing foods without chemicals in its warm wet production season. Although domestic production is expected to rise over the forthcoming years, demand for organic products will continuously outgrow domestic supply by far, resulting in potentially substantial volumes to be imported. This report has made apparent, however, that serious constraints exist which limit the organic market in its growth and frustrate imports of fresh organic fruit and vegetables. The most important constraint is the high phytosanitary requirements, which result in fumigation of imported organic products, which thereby lose their organic label. Moreover, due to confusion of the definition of "organic food" during the last decade, Japan has a well-developed demand for "green" products. However, with the new JAS organic law as of April 2001, these green products are no longer allowed to be marketed as organic. Therefore, although the market for "green" products is well developed (with an estimated sales value of US$2.5 billion), the value of sales of certified organic products is estimated at only US$350 million. Additionally, careful market research needs to be carried out before a new product or brand enter the Japanese market. Access to the market can best be gained through a Japanese importer or distributor, but one needs to be aware of possible language difficulties and cultural differences. For organic products certified by foreign certifying agencies, the new JAS poses no new difficulties of a technical nature, although mechanisms for entry into Japan vary according to the status of that agency. Details on import rules are given in section three on imports in this chapter. Japanese newspapers have reported that the impact of the new JAS regulation may decrease domestic organic sales because many Japanese organic producers may not be able to meet the strict standards, thereby creating a demand for more imports (FAS, 2000). Other products with significant market potential include honey and herbal tea, among others. The major advantage for frozen and processed products is that they are not fumigated upon arrival in Japan and can be sold as certified organic without any problem. If fumigation issues can be resolved, there will be a wide range of opportunities for fresh organic fruit and vegetables. Heat treatment plants (as established in e.g. Australia, Hawaii, Fiji, Tonga, Cook Islands and other countries), which use hot air to treat the skin of various fruits and vegetables to kill pests and skin pathogens, may provide a good alternative for fumigation. Foreign exporters, however, are likely to find severe competition from countries near Japan (e.g. China and the Republic of Korea). These countries, with generally low production costs and close proximity to Japan (an important factor in ensuring product freshness) have been rapidly expanding their fresh organic production over the past years. Organically certified soybeans from China are a major organic export to Japan. Improved product quality and Japanese consumer perceptions of improved environmental management also help to promote organic products from the Republic of Korea and China. Betteridge K., Gendall P., Bailey B., The Japanese Market for Organic Fruit and Vegetables, Massey University, New Zealand, 1997. The Law Concerning Standardisation and Proper Labeling of Agricultural and Forestry Products (July 1999). Japanese Agricultural Standard of Organic Agricultural Product Processed Foods (January 2000). Japanese Agricultural Standard of Organic Agricultural Products (MAFF Notification No.59, January 2000). Technical Criteria of Certification of Manufacturers Concerning Organic Agricultural Products Processed Foods (MAFF Notification 818, June 2000). Technical Criteria of Certification of Production Process Management Director Concerning Organic Agriculture Products (MAFF Notification No. 819, June 2000). Technical Criteria of Certification of the Importer Concerning Organic Agricultural Products and Organic Agricultural Product Processed Foods (MAFF Notification No. 821, June 2000). Inspection Methods Concerning Production Processes of Organic Agriculture Products and Organic Agricultural Product processed Foods (MAFF Notification No. 830 June 2000). Technical Criteria of Certification of the Subdivider Concerning the Organic Agriculture Products and the Organic Agricultural Products Processed Food (MAFF Notification No. 829, June 2000).